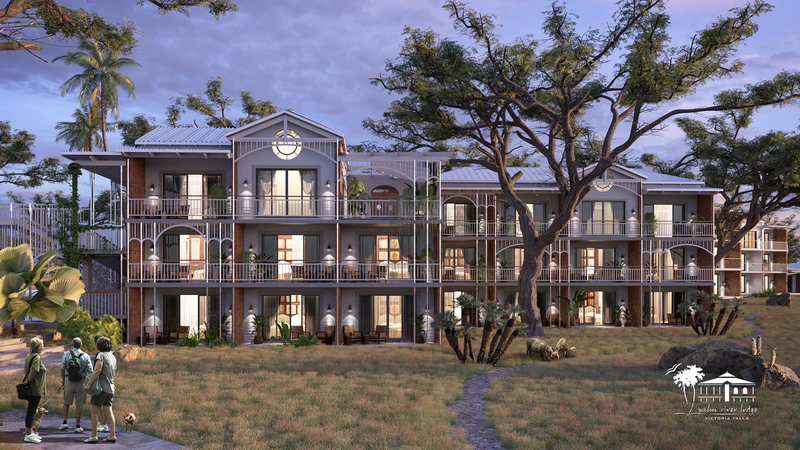 A luxury hotel, the Palm River Lodge, on the banks of the Zambezi River in Victoria Falls, Zimbabwe is set to open in May 2020, the 70-room hotel will be built in Queenslander architectural style. Find out more about this exciting new development - set to become a favourite in Vic Falls. The idyllic location of the Palm River Lodge offers an unmatched panoramic view of the renowned Zambezi River, just a short distance from the mighty Victoria Falls waterfall. Guests staying at the hotel will experience the tranquil riverside location, its beautiful landscapes and the wildlife that roams within. The Palm River Lodge takes inspiration from a rich local history of Victoria Falls town, as illustrated in its high ceilings, spacious verandas and iconic Queenslander style architecture. It will cover a total floor space approx. 8000 square metres. Inside reflects a modern, natural and stylish elegance, with 73 generously-sized deluxe guest rooms, a luxurious presidential suite, two honeymoon suites and two private villas. The Palm River Lodge will also offer a relaxing spa, state-of-the-art gym facilities and an outdoor swimming pool. The hotel will present two unique dining experiences, including indoor á la carte fine-dining and outdoor dining on the banks of the Zambezi River. Guests may also delight in luxury river cruises onboard the Ra-Ikane River Cruise, owned by the Ilala Lodge Hotel Group. Striving for first-class service with immaculate attention to detail, the plus 4-star hotel is scheduled for completion in June 2020.